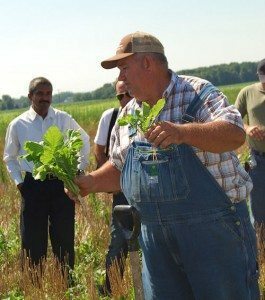 OWENSVILLE, Ohio (Jan. 8, 2015) – Farmers with fields in the East Fork Lake watershed may now sign up for a second round of funding to set up conservation practices that help keep sediments and nutrients on farm fields and out of the lake. Since 2012, East Fork Lake has experienced worsening problems with harmful algal blooms thought to be caused by excess nutrients – mainly nitrogen and phosphorus – that come from agricultural fields as well as failing septic systems, wastewater treatment plants and urban runoff. In January 2015, the Clermont Soil & Water Conservation District (SWCD) was awarded a five-year, $600,000 grant through the U.S. Department of Agriculture’s Resource Conservation Partnership Program to help reduce nutrient loadings through agricultural conservation practices such as cover crops, filter strips, nutrient management and more. Any farmer within the East Fork Lake watershed who is interested in participating in this program should contact Lori Lenhart at 513-732-2181 ext. 102, or at lori.lenhart@oh.usda.gov. The deadline to submit an application for funding is Friday, Feb. 19. Established in 1943, the district works with the Natural Resources Conservation Service and farmers to control erosion, promote water quality, and enhance wildlife habitat on agricultural working lands. The district provides technical assistance, grants and cost share funding, educational programming and other resources to urban, rural and suburban landowners to help them address a diverse range of local conservation issues. For more information, visit www.clermontswcd.org or call 513-732-7075.